So you have a blog… yay for you! It’s one of the best tools to improve SEO and establish trust with your audience. You may have realized, however, that blogging is not as easy as it sounds. Once you figure out how often to blog and a few topics (not easy tasks), then you have to decide how to add images, make it readable, get people to your site to read your content, etc. etc. etc. Even the most experienced blogger can get overwhelmed and intimidated! Well, I’m here to help. So many tools exist that can help with these endless tasks. Wading through them has its own set of challenges. 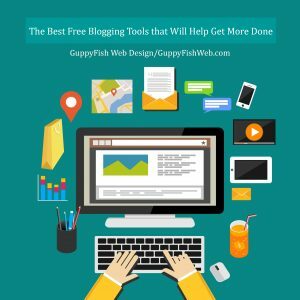 I’ve compiled this list of free blogging tools that I use to keep me on top of things. To make it easier to follow, I’ll break it down by tasks over the next few posts, so stay tuned! I’d also like to thank a friend and fellow blogger for adding some tools to the toolbox. Writer Melissa Byers has written and edited for sites including BabyCenter.com, Caring.com, and Vacatia.com, and is founder of MyrtleBeachforFamilies.com. Every great post starts with planning, right? Well, here are some amazing free blogging tools that will help with just that. How are you spending your time? To be an effective blogger, you have to plan well. Toggl is a time tracking tool that allows you to break your tasks down into projects and create reports of what you do. Knowing how you spend (or waste) your time opens your eyes to areas of improvement. You can’t plan a blog if you don’t have the time. Trello is one of my favorite tools, and one I also use to manage website projects with clients. It’s like a giant white board with limitless possibilities. A blogger can keep track of blog ideas and categories, tasks, status, and so much more with this tool. It has literally changed my workflow and allowed me to organize so much better. If you have others working on your blog, your entire team can keep track of tasks right here. There are so many uses for Evernote, a popular note taking app, but it’s an awesome tool for planning your blog, too. You can list ideas here when they pop into your head, then expand on them as you have time. When it’s time to write, you have everything right there. Google Keyword Planner is an extension of Google AdWords, and it can seriously help when you’re trying to find blog topics. What keywords are trending for your industry? Use this amazing tool to find new keywords, get forecasts and metrics for keywords, and more. I found a very well written guide to using Google Keyword Planner that explains everything way better than I could. So that about rounds it out for free blogging tools to help you plan. Stay tuned for the next installment to help you write that amazing post! In the meantime, keep swimming along!